It is a tumultuous time for India’s Cals Refineries Ltd (BSE: 526652), having been barred recently from further equity expansion by the country’s securities regulator SEBI, but with the company showing a brave face by announcing plans1 for a 60% stake take-up by Vienna based Hardt Group, even while it awaited a crucial FDI clearance from India’s CCEA and a land lease extension from the state of West Bengal. Yesterday, it received a further setback when the country’s Foreign Investment Promotion Board (FIPB) withdrew its recommendation to CCEA to consider Cals’ FDI proposal. In its interim ex-parte order dated 21st September 2011, India’s Securities and Exchange Board of India (SEBI) had directed Cals Refineries not to issue equity shares or any other instrument convertible into equity shares or alter their capital structure in any manner till further directions in this regard. Six other listed companies have been served similar directives in this order, titled, ‘Market Manipulation Using GDR Issues‘. Also, one FII, four FII Sub-Accounts, and five domestic clients have been banned from dealing in securities or instruments with Indian securities as underlying, in any manner whatsoever, until further orders. And the strictest censure in this order was reserved for Pan Asia Advisors Ltd & Arun Panchariya, being banned from rendering services in connection with instruments that are defined as securities in the Indian market or in any way dealing with them, with immediate effect, and the order also includes that none of the intermediaries registered with SEBI shall deal with Panasia and Arun Panchariya in any capacity. What SEBI seems to have uncovered is a major stock market scam involving unjustified GDR2 issues and later silent dumping of the same on unsuspecting Indian investors at high prices, but which later entered into a free fall due to the continuous silent dumping of huge volumes of shares. In its exhaustive and impressive report that was aided by some sophisticated market-monitoring software tools, SEBI has treated Cals Refineries’ case distinctly from the other six listed companies. Also, SEBI has made no connections between Cals and Pan Asia / Panchariya, no connection between Cals and the indicted FII/Sub-Accounts, and no connection between Cals and the indicted domestic clients, except for one. SEBI has now identified this operator in Cals Refineries counter as JMP Securities Pvt Ltd. The regulator has identified that during the monitored period from August 1st 2009 to August 24th 2011, JMP Securities, who was the top client in the counter, was helping Merrill Lynch Capital Market and Taib Bank, the top sellers, in selling off their GDR converted shares in the Indian market. However, SEBI has not implicated Merril Lynch or Taib in this report. Is Cals’ Case Different From Other Barred Companies? It should be noted here that Cals Refineries also stands out from the six other listed companies that have been similarly barred, for another reason. Almost all of them are relatively tiny companies by market cap, with the largest among them, K Sera Sera Ltd, having only a market cap of Rs. 99 crore which is around just one-third of Cals’ market cap of Rs. 265 crore. Others are much tinier - IKF Technologies Ltd at Rs. 51 crore, Avon Corporation Ltd at Rs. 19 crore, Asahi Infrastructure & Projects Ltd at Rs. 11 crore, and Maars Software International Ltd at just Rs. 8 crore of market capitalization. But a flipside of this argument is that most of them are having some kind of ongoing business operation, whereas Cals Refineries is still in the project implementation stage. Cals’ higher networth vis-à-vis these other companies is, however, likely to bring in greater scrutiny on one front, as one of SEBI’s underlying themes in this report is that all these companies have used mega GDR issues to boost their networth from tiny original levels. SEBI has noted that Cals GDR is the extreme example in this regard, as it increased the company’s equity base to 13,133% of the original equity. One doubt that readily springs to anyone’s mind is whether Cals’ 2007 GDR was allowed this much latitude back then, by the concerned authorities, as it was an FDI into the crucial petroleum sector. Secondly, Cals Ltd was an almost dysfunctional small-cap computer education company back then, which was taken over by Spice Energy Group, the new promoters, to act as a BSE-listed shell company for the project. Computer Aided Learning Systems (CALS) Ltd, however retained its acronym (Cals) probably as a play on the word ‘petrochemi-cals’, but which appears to have been an immature step now. Around the same time-frame of 2007-08, Spice Energy Group had also acquired another BSE-listed firm, Hitkari Fibres Ltd, as a shell company and renamed it as SRM Energy Ltd (BSE: 523222), but which was through a court approved merger process. A related concern to the networth issue that SEBI has raised is whether these companies that didn’t stand much of a chance for a similar-sized mega domestic issue, due to tighter regulations, used the GDR route and subsequent GDR cancellations to dump these shares on Indian public, which amounted ultimately to the effect of a domestic public issue, but without public’s knowledge like in an FPO, rights issue, or QIP. Moreover, SEBI has remarked that Cals’ further plans for another GDR issue of Rs. 1425 crore “appears very unusual”. Some recent media discussions on better regulations for future GDR issues, calls for SEBI to directly monitor these overseas issues from now on, and to bring in mandatory lock-ins for GDR investors that will prevent rapid conversions and dumping in India, with some observers calling for at least 1-to-3 months of lock-in. While Cals’ 2007 GDR didn’t have a lock-in, the recently proposed GDR for Rs. 1425 crore has a 1-year lock-in. At the crux of SEBI’s action against Cals, seems to be the doubt whether the company or its Directors were in any way involved in the systematic, continuous, and massive sell-off that saw the scrip price initially soaring by 10 to 13 times of the face-value during the GDR-buzz months of Nov-Dec-Jan FY’ 07-08, and then slowly falling to 6-to-2 times in the subsequent months, and to less than the GDR price (face value) by January 09, and even worse, to just one-third of the face-value by 2010-11, and which is continuing now. Such free-falls sometimes happens when large quantities of pledged shares by promoters, when not revoked in time, is dumped by the lending institutions. Needless to say, thousands of investors, especially retail investors, must have been hurt by the falling-knife nature of Cals’ stock during this period. SEBI has noted that JMP was not accumulating the shares for themselves by buying from Merrill Lynch and Taib, but systematically selling it off to a dispersed crowd of domestic investors. StockExplain recently asked Cals Refineries management whether any of their promoters or directors were involved in the sell-off. Cals has replied that they can’t find anything against the company, promoters, or directors in the SEBI report itself. While it is technically correct that none of Cals’ directors or promoters have been named or implicated in the report, SEBI has made some interesting observations regarding a claim made by D Sundararajan, then CFO of Cals’ promoter group, Spice Energy, on Jan 29 2009, in an article published by the leading business newspaper, Hindu Business Line. Asked about the then prevailing low promoter group stake of 0.11%, Sundararajan (now MD of Cals) had replied that 3 promoter group families had subscribed to the GDR and were in fact holding around 75% stake through the GDR, which was not visible to the Indian market. SEBI, however, notes that the company later corrected this stand about the nature of this stake, when it clarified with the regulator that promoters had not subscribed to the GDR, but acquired it via open market transactions in the Luxembourg Exchange where the GDR is listed. Anyway, when the shareholding pattern of the GDR was disclosed for the very first time in December 2010 - due to a new regulation by SEBI - the promoter group stake in GDR was found to be only 13.66% and not the earlier claimed 75%. Has the Promoter Group of Cals Changed? Interestingly, on a recent StockExplain query on the matter, Cals has clarified that only the Rastogi family is the promoter of Cals Refineries now. Nyra Holding Pvt Ltd is the main promoter group company having a stake of 2.81%, while family scion Gagan Rastogi holds another 13.38% through GDR. Asked to clarify on the share holding pattern of Nyra Holding, which is incorporated as an NBFC, Cals has replied that it is wholly owned by Spice Energy Pvt Ltd. But when pointed out that a recent filing at SEBI shows that Spice Energy doesn’t have any share in Nyra, Cals has clarified that the filing had an error due to an inadvertent oversight by a group company, and that Nyra is indeed controlled by Spice Energy Pvt Ltd.
Cals has also disclosed to StockExplain that Deep Rastogi family holds the majority shares of Spice Energy Pvt Ltd. We have later found out from a recent filing at SEBI that the Rastogi family’s stake is 80.09%. Anyway, what about the other two families - of Sanjay Malhotra and Ravi Chilukuri - who were also original promoters of Cals? The reply from the company is that they are not involved with the company now. But on asked about the share holding pattern of Cals Refineries’ other promoter group company, SRM Exploration Pvt Ltd (not to be confused with the listed group company SRM Energy Ltd), Cals management has clarified that it is still equally held (approximately) by the Rastogi, Malhotra, & Chilukuri families. SRM Exploration still holds 87 lakh shares or 0.10% stake in Cals as per the latest SHP filed at BSE. What that also means is that, somewhere along the line, these three groups have bought over the stakes of two other original promoters. The document ‘GDR Listing Particulars’ dated 12th December 2007, a copy of which is with StockExplain, shows that SRM Exploration was mainly held by five investors - Ravi Chilukuri, Bhulo Kansagara, Sanjay Malhotra, Mohinder Verma, & Gagan Rastogi - each with 18.20% stake. At the time of Cals’ GDR issue, the budget airline Spice Jet was disclosed as a promoter group company, with Bhulo Kansagara owning 12.91% and Sanjay Malhotra owning 2.49% of the airline. The collective networth of Cals’ promoting group, Spice Energy, was disclosed as $2 billion, back then. Further explorations regarding the remaining 20% stake of Spice Energy Pvt. Ltd. revealed that some of these older players still have a significant stake in this company too. While Ravi Chilukuri holds nearly 10% stake, one Swarupa Saha holds 5% stake. SR Malhotra and Meenakshi Malhotra together holds the remaining stake of around 5%. Later we found out that the Malhotras are the parents of one of Cals’ original promoters, Sanjay Malhotra. Apparently, through their holdings in SRM Exploration and Spice Energy, Sanjay Malhotra and Ravi Chilukuri families are still significant shareholders but not promoters now. While Malhotra never seems to have been a Director of Cals, Chilukuri had resigned as a Director of Cals Refineries on 25th January 2011. Euroclear has been one of the international central securities depositories (ICSD) offering payment and settlement services for Cals GDR, along with Clearstream. Interestingly, a petition had been filed by Mrs. & Mr. SR Malhotra with India’s Company Law Board, a quasi-judicial body, against the Rastogis, Chilukuri, Spice Energy, some major shareholders, and some group companies, alleging mismanagement in Spice and also that all of them acted against a claimed anti-dilution guarantee that ensured that the Malhotras will always hold 50% stake in Spice Energy, even if equity was diluted. The Rastogis and other defendants have denied these charges in their reply. However, in its first hearing on December 23rd, CLB ordered that no further Board Meetings of Spice Energy shall be conducted until further orders. In its subsequent hearing on May 04th 2011, CLB allowed some concessions, and Spice Energy has given the undertaking that board meetings wouldn’t take any actions detrimental to the Malhotras. The bone of contention - as evident from the arguments of both sides - is not the control of Cals Refineries, but for the control of listed group firm SRM Energy Ltd, whose Cuddalore power project has made more headway than Cals. Spice Energy Pvt. Ltd. holds a handsome 71% stake in SRM Energy Ltd. Whoever controls Spice will control SRM Energy. However, it can’t be denied that the control of Cals Refineries is also an issue, as Cals’ main domestic promoter is Nyra Holding controlled by Spice Energy. The last hearing on this case by CLB was on August 23rd, and when asked to comment on the case, Cals confirmed the case by Malhotras and informed that the next hearing is scheduled for November 2011. Did a Put Option Cause the GDR Sell-off? If at all the discrepancy between 75% and 13.66% was due to some ex-promoters offloading their stakes, there is a lingering doubt whether this was due to a ‘put’ option on promoters through a Total Swap Agreement (TSA), which was exercised by some original institutional investors in the GDR. The case of Livermore Investments Group, an institutional investor registered at British Virgin Islands, and listed in LSE AIM, is a case in point. Livermore’s annual report for 2008 and 2009 indicates that it was an original investor in Cals Refineries GDR, and that its investment in Cals was protected by a put option on Cals’ promoters on any possible downside. “"In December 2007, Livermore entered into a Total Swap Agreement (TSA) with respect to a Global Depositary Receipt (GDR) issued by an Indian refinery company – CALS Refinery. The TSA has a capital protection structure through a put option on the promoters...CALS has had to delay the shipment of the refinery from Germany as it could not raise the necessary funds following tight financial markets. Currently the company is operating at a bare minimum level due to lack of resources. The promoters and management of CALS are making efforts to achieve financial closure...Following the notice of put option exercised by the TSA counterparty to the promoters of CALS, no common ground has been found despite lengthy negotiations. Consequently, the TSA counterparty has started legal action against the promoters of CALS. 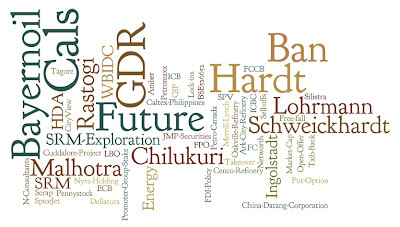 Considering the legal uncertainties and the likely delay in enforcement of the put option, and also considering the decline in price of the underlying GDR, management carried-out an impairment test based on which an impairment loss of USD 5m (representing 50% of the total investment cost) has been recognized." The new Consolidated FDI Policy, announced a few days back, has now banned put option in connection with FDIs. RBI has gone even one step forward and warned companies that any attempt to provide put option to investors would force it to consider the FDI as not equity, but as an External Commercial Borrowing (ECB). Anyway, the final question before investors is how serious is the SEBI ban. The company itself thinks that it is quite serious. Cals informed StockExplain that it has already made two representations to SEBI, and has requested for an early hearing on the matter. Yesterday, the company filed at BSE that SEBI has allowed a hearing on November 8th. The serious nature of the SEBI ban against the 19 entities / companies (including Cals) is also hinted by the fact that SEBI is forwarding a copy of the order to Enforcement Directorate. Is SEBI seeing a fundamental problem over here? But if anyone agrees with that argument, a big question is why then did FIPB, India’s apex body for regulating foreign direct investments (FDI) recently recommend Cals’ further GDR for Rs. 1425 crore to India’s Cabinet for approval? On June 6th, Cals had got a big boost when India's Foreign Investment Promotion Board (FIPB) published that they had recommended Cals' Rs. 1425 crore FDI proposal for the consideration of the country’s Cabinet Committee for Economic Affairs (CCEA). Anyway, FIPB has yesterday corrected its stand by withdrawing the recommendation to CCEA, and asked the company to approach FIPB again once the facts of the case change with respect to SEBI’s order. Chaired by Secretary, Department of Economic Affairs, FIPB currently has 10 other top-level Government Secretaries as its members viz. 1) Secretary, Department of Industrial Policy & Promotion; 2) Secretary, Department of Commerce; 3) Finance Secretary; 4) Secretary, Department of Revenue; 5) Secretary, Ministry of Overseas Indian Affairs; 6) Secretary, Ministry of Micro, Small and Medium Enterprises; 7) Secretary (ER), Ministry of External Affairs; 8) Director General, Directorate of Currency, Department of Economic Affairs, Ministry of Finance; 9) Joint Secretary (I&I), Department of Economic Affairs, Ministry of Finance; and 10) OSD (CM&I), Department of Economic Affairs, Ministry of Finance. (Designations numbered 3 and 4 are vested on the same officer now). If stories appearing in some petroleum trade journals on the web are to be believed, Cals’ FDI proposal didn’t have an easy pass-through in FIPB, and that at least some Secretaries opposed it. But finally after all the debate, FIPB didn’t reject the proposal, but recommended it to CCEA for final approval as it involved over Rs. 1200 crore which is the sanctioning limit for FIPB. Chances are that SEBI is seeing more than what regulators like FIPB has seen on this issue. Or maybe Cals’ FDI proposal was given the leeway of being considered by the CCEA as it involves a large FDI into the crucial petroleum sector. Is There Any Alternative Route for Cals? Anyway SEBI’s regulatory action against these six listed entities, including Cals, hints that future GDR issues by any companies would be closely monitored by the regulator. SEBI Chairman UK Sinha has also made it clear through recent media interactions that the regulator is working with Finance Ministry to bring in stricter regulations regarding GDRs, which hitherto enjoyed easier regulations compared with other FDI instruments. Of course, it goes without saying that all such alternate instruments would also require the SEBI bar to be revoked, as what the regulator has barred is not just GDRs but any form of equity expansion. More Legal Woes for Promoters? It seems that the past legal fight with Lohrmann or the present one with the Malhotras aren’t the only legal issues faced by the Cals’ promoters. In a winding-up petition filed against SRM Exploration Pvt Ltd (one of Cals Refineries’ promoter companies) by a Czech firm named N & S & N Consultants, the Delhi High Court has allowed the winding-up of SRM and appointed a provisional liquidator for the purpose. In its order dated March 4th 2011, Court has also ordered that SRM Exploration and its directors/officers are restrained from selling, parting with possession or creating third party rights in respect of its movable and immovable properties/assets till further orders. When contacted by StockExplain recently regarding this case, Cals admitted the development, and informed that they are contesting the order. Asked to clarify their stand on the case, Cals has replied that, “The petition has been admitted. It is a false claim on the Company.” The last hearing date was on 13th September, on which it was adjourned to 14th December. The case relates to SRM Exploration through Ravi Chilukuri standing as a guarantor in a company purchase agreement between N & S & N Consultants (the seller) and another Czech firm. The purchaser defaulted, and the purchase amount that SRM allegedly undertook to guarantee amounts to 230 million Czech Korunas or around Rs. 63 crore. Another legal issue facing some group companies, including Cals Refineries, is a set of 3 cases filed by one Dellatora Enterprises Ltd seeking compensation of $1.66 million or around Rs. 8.10 crore. First of these cases is a winding-up petition against SRM Exploration Pvt Ltd, one of Cals’ promoter companies, that resulted in Delhi High Court ordering a restraint on SRM from transferring, alienating, or parting with possession of the immovable assets of the company otherwise than in due course of business. The case relates to a $9,50,000 investment made by Dellatora in SRM and non-allotment of shares against it. The court order from October 2009 is still in force, the last hearing was in August 2011, and the next is in November 2011. The second case by Dellatora filed in 2010 is over the same issue, but it also drags many group firms, persons, and entities as respondents including Cals Refineries, Sanjay Malhotra, Gagan Rastogi, and a few others. Basically aimed at recovery of the said $1.66 million, it also asked for a wider restrain against group companies that also includes a restrain demand against Bank of New York Mellon for maintaining status quo regarding Cals GDR, and even a restrain on five group companies from modifying their websites, including ‘cals (dot) in’ and ‘spiceenergy (dot) com’. In its order passed in May 2010, the court restrained the defendants from tampering or changing the web-sites except in normal course of business. The court also appointed a Local Commissioner as per the request of Dellatora to study various evidences submitted by it and the matter is now slated for hearing before Joint Registrar of Delhi High Court in November 2011. A third case filed by Dellatora on the same issue is a criminal case filed in 2009 against Sanjay Malhotra, SR Malhotra, Meenakshi Malhotra, Gagan Rastogi, Deep Rastogi, and two group firms. The court summoned all of them except Deep Rastogi as there was no case made against him for a summons, and all were granted bail. The last hearing on the matter was on July 2011. There are also a couple of cases of relatively minor impact against the group, by a former director and former employee for recovery of alleged dues. There was an even greater shock than the bar on equity expansion by SEBI, during the company’s recent AGM. From the speech4 of Executive Chairman Deep Rastogi at the Annual General Meeting of shareholders, a formidable loss emerged. It was a risk that was mentioned - but not highlighted - in last two fiscals’ annual reports5, a risk that became deeper and clearer in the last quarterly disclosure6 filed at BSE, and which finally crystallized in Rastogi’s speech: Cals Refineries has lost Bayernoil’s Ingolstadt Refinery. Though Rastogi mentioned about a last-ditch effort to save some critical equipments from Bayernoil Ingolstadt, for many investors it should have felt like a crude if not cruel joke. Because, that last-ditch effort was about salvaging some crucial Bayernoil equipments from the scrapping contractor who is entrusted with cleaning up the refinery site. So, what went wrong suddenly? If Chairman Deep Rastogi’s statement can be taken at face value - and indications of the same had come in a section of German media recently - the refinery is indeed going to be scrapped as there are no immediate takers for the whole refinery. For many Asian minds this can be a difficult idea to digest - refineries going for scrap value, while it can be salvaged and put to good use somewhere in Asia. Apparently, Cals failed again on a payment schedule, Lohrmann couldn’t find another buyer, and Bayernoil had to cede to the pressure from Ingolstadt to turn over the prime real estate long occupied by the refinery, for the city’s redevelopment purposes. Bayernoil Ingolstadt is not alone in this predicament, however. Cenco Refinery of US - which Cals proposes to buy through Hardt - has in their website this prominent notice: “The 50,000 barrel per day refinery has been sold. However, some units and equipment that are not part of the sale remain available…however, no scrap metal or materials are available for sale”. Evidently, scrap vendors are the ones more interested in older and non-refurbished refineries and their equipments, be it in Europe or USA. A news story contradicting this commonsense view has, however, appeared recently in Wall Street Journal titled, 'Asian Firms Eye U.S. Refineries to Dismantle, Export', quoting a couple of arrangers to such deals. However, the article doesn’t name any specific Asian-American refinery deals except for an Indo-US PVC factory deal and an all-American deal about a Louisiana refinery being bought by a Texan firm. Anyway, as things stand now, Cals’ last-ditch effort to source from the scrapping contractor is not likely to be taken kindly by the market. And that is not the big issue facing Cals either. The impact of that loss is easy to understand. Rs. 335.59 crore paid to Bayernoil is 41.30% of Cals’ current equity capital of Rs. 812.88 crore. With no reserves or surpluses (Cals has always issued shares at face value), what that means is that the company has lost 41.30% of its net asset value (NAV), networth, or book value (BV). Though these numbers won’t be calculated right now by many retail investors, the BV per share practically stands corrected from Rs. 0.99 to Rs. 0.58. Obviously, the effort seems to be to source useful equipments at cheaper prices from the scrapping contractor, and to see whether that can offset a part of their losses. It appears a difficult challenge as of now. The only silver-lining in Cals’ capital advances till now is that, as per the latest Annual Report, which was published recently, apart from the Bayernoil advances of Rs. 335.59 crore, only an additional Rs. 31.14 crore of advances has been shown as carrying significant risks. That leaves Rs. 458.34 crore or 55.55% of advances being implicitly shown as risk-free. Cals loosing the Bayernoil advances has attracted an added dimension in recent days, with SEBI Chairman UK Sinha communicating to media that the main problem with many GDR issuing companies is that they haven’t repatriated the issue proceeds back to India. Spice Energy Group’s other listed arm, SRM Energy Ltd, is in a relatively better shape than Cals. But it has not reached a stage where it can be unequivocally declared as safe. The achievements over here is that for their Cuddalore power generation project, International Competitive Bidding (ICB) has been completed and the EPC contract worth $1.5 billion has been awarded to a subsidiary of China Datang Corporation, which is the largest power utility in China. A tripartite agreement has also been signed by both parties with Industrial and Commercial Bank of China (ICBC), which is China’s leading bank for financing export buyer’s credit, backed by insurance from China Export & Credit Insurance Corporation. The agreements were inked in the presence of Chinese Premier Wen Jiabao on 15th December 2010. Environmental clearance has also been obtained for the project. However, this project is also facing many challenges still. Due to incurring huge cash losses, the networth of the company has been significantly eroded. On a networth of Rs. 9.06 crore, losses have risen up to Rs. 7.20 crore. However, promoters are trying to convert their Rs. 44.51 crore of loans to SRM Energy into the company’s equity. A Rights Issue is being planned, largely to facilitate this, which involves a 65:10 allotment at par. But this Issue has run into problems, with SEBI disallowing both conversion of the loans into equity, and allotment of new shares against unsubscribed shares in the rights. SRM Energy is now contesting the case in Securities Appellate Tribunal (SAT). Other major risk involving the project is that financial closure has not been completed. SRM Energy is also divesting the Cuddalore project to a wholly owned unlisted subsidiary, which will act as a project-specific Special Purpose Vehicle (SPV), on no financial consideration, on the argument that institutional investors and lenders would be more comfortable with investing/lending to an SPV. However, on the long run, this may prove to be a risk to the public shareholders in SRM Energy holding 28.81% of shares. Is Hardt Group Taking Over Cals? 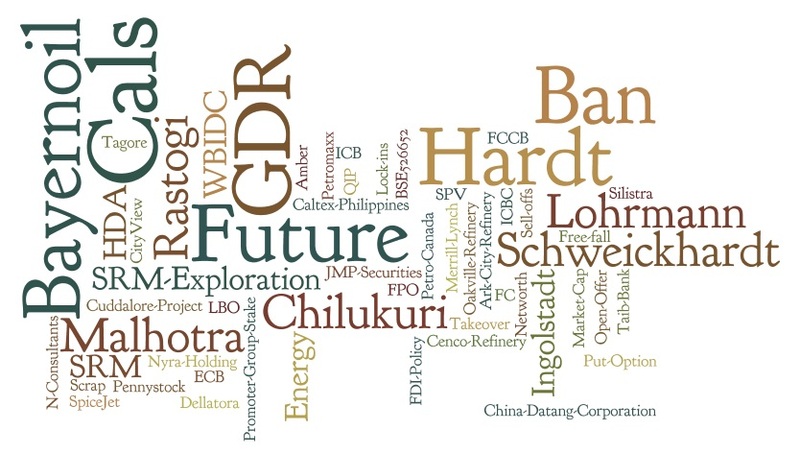 While older deals hung in the balance of uncertainty, Cals had gone ahead during the last several months with plans to acquire further refineries from Vienna based alternative investment firm, Hardt Group. StockExplain had reported on 16th March 2011, the implications of the deal with Hardt which is basically an equipment-against-equity deal worth Rs. 1425 crore on one side and two used refineries - Cenco & Atas - on the other side. In the comments section (dated 22nd March 2011) of that report11, StockExplain had also mentioned that “… it will amount to a clean take-over of Cals Refineries,” which was recently mentioned through a media interview by Hardt CEO. Though this interview in a leading business channel of India, NDTV Profit, showed a confident Hardt CEO, Alexander Schweickhardt, briefing about his impressive plans to have an over 60% stake in Cals Refineries, and with even more impressive summary captions accompanying the coverage like ‘Hardt to Own Cals’, and ‘Hardt to Become Promoter of Cals Refineries’, several crucial questions remained unasked and unanswered in the 1 minute 40 seconds coverage. Second question should have been, if the resolutions are re-worked and voting rights are allowed, won’t such a stake-buy by Hardt amount to a takeover that will automatically trigger an open offer for other shareholders? SEBI had ruled in 2009 that share transactions involving GDRs with voting rights, that would amount to a takeover, would trigger an open offer. There were other troublespots too in the interview. Of the two messages conveyed, the news about 60% stake was nothing new. It was the writing on the wall, as soon as the Rs. 1425 crore equipment-against-equity deal was passed by the shareholders13. But the other message was indeed new - that Hardt is now coming in as a promoter. Though the video coverage clearly admitted that the deal required a crucial CCEA approval, the more recent news about the SEBI bar, the revocation of which is also crucial for the deal, was not mentioned. Also adding to the confusion was a caption shown midway, ‘Hardt to Buy Cals Refineries Promoter Stake’, which was probably a mistake. Alexander Schweickhardt also hinted about three new developments in the interview. The interaction which started off with a clarification that it was not a hostile takeover, however conveyed the message that Schweickhardt will be bringing in a new management team, “the best people”, in his own words. Alexander Schweickhardt himself was co-opted as an Independent Director of Cals Refineries a few months back. However, it is not known whether SC Maheshwari who joined Cals Refineries recently as Vice President (Projects) is one among Schweickhardt’s new team. Maheshwari, according to Cals website, is a former General Manager of state-run BPCL, India’s third-largest refiner and a Fortune Global 500 Company. Cals has also noted in his executive profile that Maheshwari has a track-record in revamps and upgradation of old refining units to bring them up to latest standards, as well as experience in co-ordinating with most international process licensors in the refining industry - which are, of course, two areas the Cals project would require special assistance. The second disclosure in Schweickhardt’s interview was that the required project finance of $2 billion dollars (for financial closure) would require another round of equity expansion, and thirdly, he spoke about a role for subordinated loans in project finance for FC. It was not clear who would bring in the subordinated loans, which are easier-to-get loans but with a higher interest outgo, and which are sometimes advanced by promoters. Is Hardt Group Up to the Task? Hardt Group was founded in 2004 as an alternative investment firm by two hedge-fund managers, Alexander Schweickhardt and Jeff Landle. Both were working at HVB, Germany’s sixth largest private bank. New York Times has reported in 2004 that Alexander Schweickhardt is an Austrian Baron, who with his wife Brenda Exline, bought two celebrity class penthouses in New York for almost $6 million. While Alexander Schweickhardt handled HVB’s hedge fund business for 10 years, Jeff Landle was handling alternative investments at Blackstone and then Commonfund, before joining HVB. The duo got a good start, as Hardt Group could kick off with a seed fund of $600 million with a 10-15 year lock-in. Their main seed investor was HVB itself, which divested its alternative investments business to Hardt, along with a dozen employees. Hardt’s other investors are few in number, but typically make large allocations, and is mainly made up of Europe’s rich family offices and institutional investors like pension funds. As of 2008, Hardt was managing assets worth $1.1 billion. And as of 2008, Hardt’s compounded returns from its flagship gamma fund was over 43%. Hardt Group was generally regarded as very innovative by Western mainstream financial media like ‘Financial Times’, as well as niche media focusing on alternative investments. Starting off as just a fund of hedge-funds, Hardt diversified through organic and inorganic ways into private equity, real estate, special opportunities, leveraged buyouts, traded life-settlement policies, and into an innovative product – incubator hedge funds – for which they had won some acclaim. Their incubator hedge fund incubated early stage fund managers with professional advice and matching equal investments by Hardt, to make good of the statistical phenomena of early stage managers outperforming older fund managers. The Group has had good returns from two private equity deals - one from a financial institution and the other from a cable television company. Hardt is said to have real estate interests in Ukraine and Dubai. However, news about Hardt Group’s achievements post-2008 is difficult to come by, and chances are that the post-2008 global financial meltdown affected their fortunes too like that of most alternative investment companies. The Group’s foray into refinery projects, though impressive for its ambition, has not yielded much results till now. Hardt’s focus on oil refineries stem from their special opportunities fund, which accounts for around 12% of their assets allocation as of 2008. Through Group company, Petromaxx Energy Group, they tried to set up a 30,000 bpd refinery at Silistra in Bulgaria in 2005-06, but the project seems to have been abandoned due to many hurdles. In 2008, they inked a deal through Group company Tagore SA to sell a 50,000 bpd refinery to Australian company CityView Corporation Ltd, which also seems to have been unsuccessful due to problems at CityView. This deal also had an equity participation by Tagore in CityView. This Australian listed pennystock is now under suspension. Anyway, the business model Hardt seems to follow in refineries seems to be leveraged buyouts (LBO) of distressed refinery assets, and selling it where refineries are in demand, and enabling such deals through accepting part payments through equity participation in the projects, which may be their business plan for Cals Refineries too. It is likely, but not confirmed, that what Cals is planning to acquire through Hardt is one or two of their earlier acquired refineries for Silistra or CityView. Any Hope on the CCEA Approval Front? In earlier communications, and before the SEBI action was announced, Cals Refineries was very hopeful of getting CCEA approval for their proposed GDR issue to be subscribed by Hardt Group. Yesterday, CCEA approval has suddenly turned to be a non-issue, as from FIPB’s action, it is clear that Cals will have to again approach FIPB for approval. In Cals Refineries’ Chairman Deep Rastogi’s speech at the recent AGM, it became clear why the environmental clearance for the second phase was still eluding the company. Haldia has been recognized as a critically polluted area, and as such there is a suspension on new industrial projects in the area. Rastogi also informed that Cals has approached West Bengal Government to sort out this issue. Cals had obtained environmental clearance for the first phase in Haldia, long back. Anyway, the greater problem facing Cals in West Bengal is not this. A deadline given by West Bengal Government14 to Cals Refineries for completion of their financial closure (FC) passed away without any public announcement from both sides. The deadline was September 30th, and Cals had earlier clarified that they have applied for an extension until March 31st 2012. West Bengal Industrial Development Corporation (WBIDC) is the state government arm that advanced around Rs. 63 crore to Haldia Development Authority (HDA) on behalf of Cals to secure land for the project as part of a tripartite agreement. Cals should repay the amount as soon as possible, or latest when FC happens. Anyway, StockExplain which tracks the website of Haldia Development Authority finds that ‘Cals Refineries Phase 1 of 5 MMTPA’ is no longer listed under ‘Major Upcoming Industrial Projects’ in HDA's site. It used to be there as late as July 11th 2011. Is there Any Hope in the Planned EPCC Contract? During Deep Rastogi’s speech in AGM, he mentioned about an interesting possibility - of roping in a reputed European contractor on Engineering, Procurement, Construction, & Commissioning (EPCC) basis15. Rastogi also hinted at such a contractor funding part of the facility, so that construction activities can commence without waiting for financial closure. StockExplain which tracks web search interest for our stories have found out recently that a few reputed construction and petroleum giants from North America, Europe, & Asia are tracking the developments in Cals. But that maybe solely due to Cals or Hardt working for their case with these contractors, and they checking on the company’s details. It should not be construed as meaning that a high profile contract is near. StockExplain had earlier also reported, from search interest tracking, that some international financial institutions are regularly checking in on Cals’ developments. Though some of this interest has waned after the recent regulatory action by SEBI, some of this interest is continuing. And needless to say, this may not mean anything spectacular, as such search interest might be solely due to such investors checking in on whether Cals will be getting the necessary clearances. Coming back to the EPCC contract, there have been instances in the Indian and international arena of EPCC contractors chipping in with funds, but it doesn’t seem realistic that such a large project like Cals, requiring more than Rs. 10,000 crore would move substantially on EPCC basis. Otherwise, the EPCC contractor should be willing to take a sizeable equity in the project, as a strategic investor, but which will be possible only if the issue raised by SEBI is successfully resolved. As of now, the promised EPCC contract appears as only a stop-gap arrangement in the face of FC getting further delayed. The hope is that such a contract will start the ball rolling. StockExplain had asked Cals on probable dates for EPCC finalization, and their answer was October 2011 end. But on passing that time-frame without any announcements, and we re-queried them on the issue, Cals has replied that EPCC finalization is taking longer than expected and the first draft of the contract is now being vetted, with hopeful conclusion within November itself. Cals has also claimed that Hardt is looking after the issue and the contractor is likely to be a European consortium of contractors. On asked to name the firm, or to confirm whether it is a specific European firm that StockExplain had found as tracking the developments, Cals has replied that there is no point in disclosing the name without finalization of the contract. Cals Refineries' Share Holding Pattern for the quarter ended September 30th is just out, and there are some changes worth noting. Taib Securities has apparently sold off significant shares, as this FII is no longer listed under investors holding more than 1% shares. SEBI had recently found that Taib was systematically cancelling and selling off GDRs with the help of a domestic client. Neelam Ramniklal Dedhia has also apparently sold off significant shares, as this person is no longer listed under investors holding more than 1% shares. Merrill Lynch Capital Market, however, has apparently bought significant shares, as they are back in the league of investors with more than 1% share, after some time now. Their holding is now 1.31%. Merrill Lynch, was recently identified by SEBI as selling off Cals GDR converted shares in the Indian market. Promoter Group stake in Indian shares of Cals, through Nyra and SRM Exploration remained steady at 2.92%. Abboro's (Hardt) stake remains unchanged at 1.46%. Abboro is still not part of the promoter group. One Maniput Investments Pvt Ltd has also bought significant shares, with their holding being shown as 1.21%. Maniput seems to be a group company of Mumbai based brokerage, Magnum Group. Maniput has in 2007 received a warning from SEBI to be cautious and apply due diligence while facilitating clients, as SEBI found that certain clients of theirs were indulging in manipulating order books in the trades of stocks like Pochiraju Industries, Cambridge Technology, Mindtree Consulting, Shree Astavinayak, Pyramid Saimira, & AI Champdany. Though 7 entities were banned from accessing capital markets in this case, Maniput was not banned. GDR cancellations continued in the quarter with total GDRs now standing at 27.08% from 29.80% in the previous quarter. The cancellations were in the public part of GDRs, with this falling from 16.41% to 13.70%. Promoter Group member Gagan Rastogi's stake through GDR remained constant at 13.38%. Institutional shareholding has taken a dip from last quarter's 3.12% to 2.05% now, due to FII selling. Non-Institutional holding (including retail investor holdings) increased further, from 64.17% to 67.95%. Among this segment, holdings by corporate bodies increased from 9.74% to 11.18%. Holdings by individual shareholders also increased to 53.71 from 51.61%, with most of it contributed by holdings of more than one lakh shares, which might be due to repeated averaging by larger retail investors. While NRI holdings also increased from 1.36% to 1.61%, shares held by foreign companies remained the same at 1.46%. Total public shareholding in Indian shares increased from 67.29% to touch 70% for the first time. Total public shareholding of Cals Refineries including GDRs now stands at 83.70%. Total promoter group shareholding including GDRs remained steady at 16.30%. In StockExplain’s first coverage on Cals Refineries on 18th December 2010, we had pointed out two serious risks - one technical risk and one fundamental risk - about the scrip and the company. This has been proven true again and again in not only Cals Refineries, but in many penny stocks. Has this situation changed? Though many things have changed since then, like Bayernoil exiting and Hardt entering, the very nature of that challenge remains the same. It is a challenge faced when relatively smaller groups attempt capital-intensive, long-gestation projects. Over and above all that, Cals Refineries now has the additional responsibility to prove before the regulators and its investors that it is a bonafide project. Investor interest - or should we say investor anguish? - will continue in the scrip as there are over 1.89 lakh public shareholders, with the bulk of it (over 1.81 lakh) being retail investors holding less than one lakh shares. A good percentage of them must be in deep losses and still holding on. Many of them must be also remembering Cals’ one-time market cap of over Rs. 10,000 crore (in Jan 2008), which is (approximately) a mark that now segregates the Top-100 Indian companies by market cap, from the thousands of other listed companies. It is high time that Cals lives up to its promises. Or, is it too late for a turnaround? Comments Section Below, After News References. StockExplain: Very well compiled article. Dear stockask, I read the whole report non stop leaving the details for a later reading. Once again I have no words to describe my feelings. Breath taking!!! !Amazing, you are inimitable.We are indebted to you and hope to pay back in some way. May God bless you and your team in all your endeavors. I am not really worried about losses, and will leave it in my dmat a/c as long as I maintain it. Fantastic analysis. I would hone in more on Alexander Schweickhardt and Hardt Group. Is he the saviour of Cals? Does he have the financial means to do so? Noting to say about this analysis..But just Woooooooooooooo..keep up your good work..Please continue to do the same! !